Magazine editor Wendy Goodman has passionately covered the world of style, first as a fashion editor and then as an interior design editor, since 1978 for publications including Interview, Harper’s Bazaar, The New York Times Magazine, House & Garden, and New York. This month she publishes her third book, May I Come In? (Abrams Books, $31), which is packed with 70 of her favorite interiors along with her often poignant, personal observations. As her popular Instagram account (@dhwendygoodman attests, New York’s design editor regularly rides the city subway in her quest to find outstanding homes to publish. In anticipation of her book release, this reporter tagged along on an expedition trip to check out a townhouse in Cobble Hill, Brooklyn. May I Come In? by Wendy Goodman (published by Abrams). 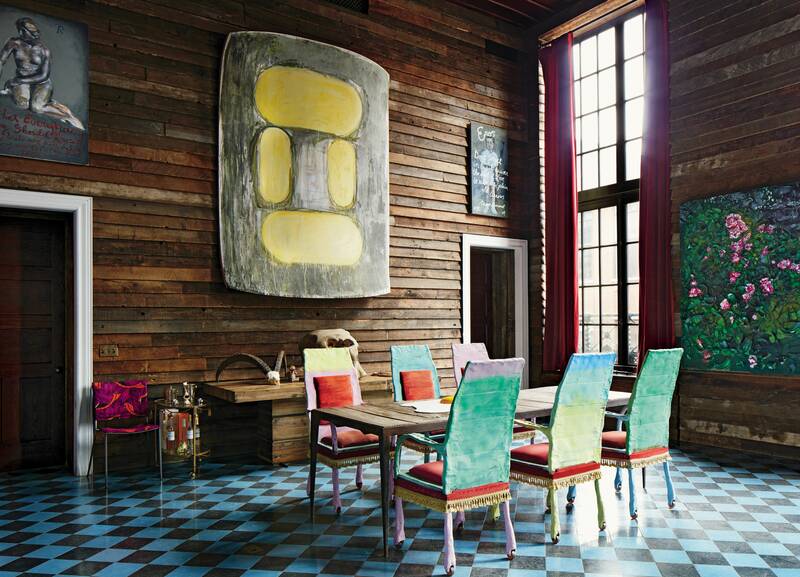 Above: Art dealer Vito Schnabel’s great room in Palazzo Chupi, the playful and colorful West Village condominium building designed by his artist father, Julian, who also created Vito’s fantastical dining chairs (Photograph by Stephen Kent Johnson). After meeting on a street corner, we descend into the subway station, Goodman wearing cool black Nikes (“for pounding the pavement”). On the next Brooklyn-bound train, we slide into two seats and Goodman explains that she was introduced to the owner of the Cobble Hill house we're about to see at a recent party. “Every event I go to, every dinner I go to, there is a little nugget to discover, a little treasure to unearth,” she says as the train hurtles under the East River. "It’s important to be out there on the street. Some young editors today think they can call it in. You can’t call it in. You have to go and see the space and understand the experience in the space. I get sent so many projects and they’re often not really right at all. I go out on my own. I’m pawing my way through the subway.” And with that the subway doors open. Goodman stops in the station to inspect a large wall map to ascertain directions to our destination. “I cherish these,” she says. The noisy streets of downtown Brooklyn are crowded with vendors and scaffolding and construction. On the sidewalk, Goodman promptly runs into someone she knows, an effervescent young designer who works on a team that revamps interiors. “We’re featuring a project of theirs,” explains Goodman. Looking from the kitchen into the living room in artist Misha Kahn and magazine editor Nick Haramis’s Brooklyn apartment. Alba Clemente at her dressing table inside the massive wardrobe storage space she had built in her husband's Brooklyn art studio. The interior walls are lined with a mural created from a blown-up photograph of the interior of an 18th-century theater in Italy. A snug corner in in the book- and art-filled living room of jewelry designer Kenneth Jay Lane. After our coffee, it's back to downtown Brooklyn and a quick hop on a Manhattan-bound train. Goodman scooches over in her seat and motions to a young woman standing with a cast on her leg to come sit next to her. At the first stop, we suddenly realize we're on the wrong subway line. The young woman in the cast asks, “Do you know where you’re going?” and offers directions and a solution. “See, I really do rely on the kindness of strangers,” says Goodman. At the next stop I disembark, but Goodman remains onboard, hurtling toward her next design adventure.